FROM aerial photographs snapped by giant bombers soaring four miles above the earth, U. S. Army engineers are compiling maps that will serve as eyes for our armed forces if they ever have to wage a defensive war on American soil. Flying out of Fort Lewis, Wash., the camera planes have recently been engaged in photographing all unmapped areas between the Cascade Mountains and the Pacific, from Puget Sound to the Siskiyou Mountains of California. With their multiple cameras they make five pictures at a crack, one straight down and four at angles ahead, astern, and to the sides. Finished prints of the photographs are sent to the 29th Engineers at Portland, Ore. Here, in two old school buildings, they are turned into topographical maps showing all important features that would figure in wartime plans. When the northwestern country has been covered completely, camera planes and map makers will move on to the Southwest, and later work their way eastward. While the photographers are snapping the terrain from the sky, survey parties on the ground extend triangulation nets and run traverse and level lines, thus establishing definite points of known elevation which can be compared with the corresponding points in the photographs. For the delicate task of turning the bird’s-eye camera views into accurate contour maps, the engineers use two somewhat similar devices, the stereo comparagraph and the multiplex aeroprojector. 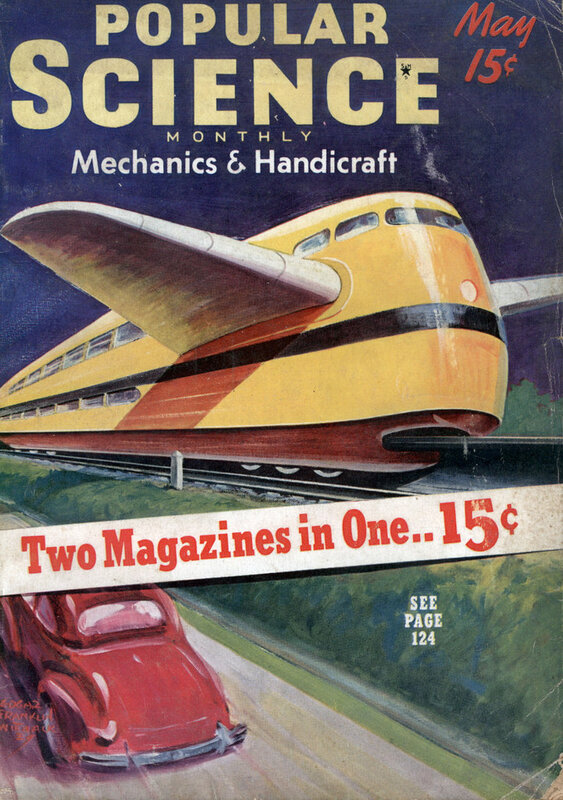 Despite their formidable names, they operate on the same simple principle that enables you to judge distances with your eyes, and to see a three-dimensional image in an old-fashioned parlor stereoscope. You can demonstrate the idea very easily. Hold a pencil two feet in front of your eyes. Look beyond the pencil at some distant object, and you seem to see two pencils; look at the pencil, and the distant object appears double. If you close your right eye, the pencil appears to move to the right; close your left eye, and it seems to move to the left. The effect is caused by your eyes seeing objects from slightly different angles, or different points of view. In using the stereo comparagraph, the map maker looks through an instrument resembling a stereoscope at two photographs of the same stretch of country, made from the camera plane in two different positions. What he sees appears to be a plastic relief model of the terrain, with mountains sticking upward and valleys scooped out. A “floating mark,” an image projected on the focal plane by mirrors, is fused into a point whose elevation has been established by the ground survey. It is then an easy matter to follow the contour line for that level across the three-dimensional image, while a pencil attached to an arm of the device traces the corresponding line on the map itself. For other elevations, the “floating point” is raised or lowered according to a scale. The same principle is applied in the multiplex aeroprojector, except that in this case the images of the overlapping aerial photographs are projected directly on the mapping surface, one in blue light and the other in red light. The effect, as viewed by the naked eye, is a seemingly meaningless jumble of color, like the illustration on page 65. However, when it is viewed through spectacles with one blue lens and one red lens, hills and valleys appear as if by magic, and all the important features of the landscape are seen with startling clearness. This time the “floating point” is fixed at the proper level on a tracing stand fitted with a pencil that draws the contour lines as the stand is moved across the map. For throwing the images on the mapping surface, projectors are mounted on a horizontal bar above the table, and can be adjusted to correspond with the positions of the camera in taking the pictures. Using either of these ingenious new devices, a worker can map directly from aerial photographs about two square miles a day. 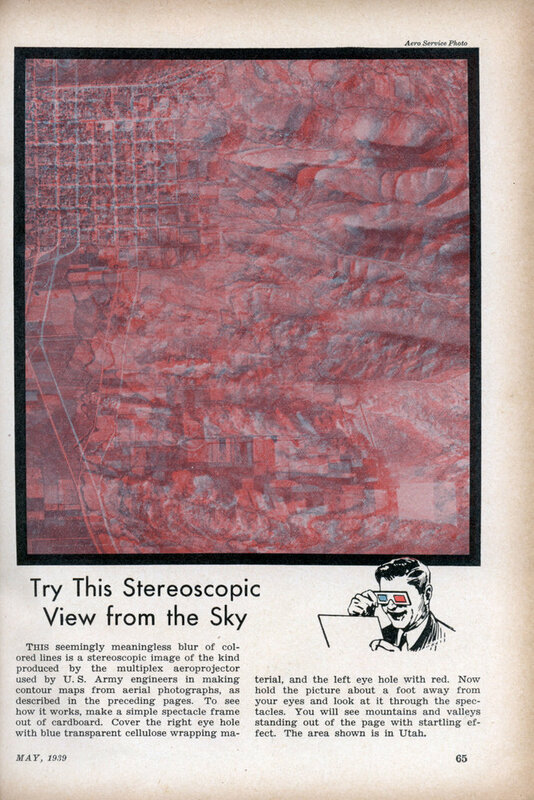 Try This Stereoscopic View from the Sky This seemingly meaningless blur of colored lines is a stereoscopic image of the kind produced by the multiplex aeroprojector used by U. S. Army engineers in making contour maps from aerial photographs, as described in the preceding pages. To see how it works, make a simple spectacle frame out of cardboard. Cover the right eye hole with blue transparent cellulose wrapping material, and the left eye hole with red. Now hold the picture about a foot away from your eyes and look at it through the spectacles. You will see mountains and valleys standing out of the page with startling effect. The area shown is in Utah. Promptly handed over to the Soviet Union within a few years.